A report on the oilsands released Wednesday concluded there is no credible evidence that pollution is reaching Fort Chipewyan at levels that would cause cancer. 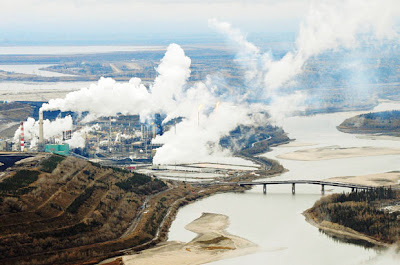 Canada’s oil industry and Alberta’s environment minister say a massive scientific report [see previous ESC article] taking stock the environmental and health effects of the oilsands is even-handed and will lead to improvements. However some members of First Nations communities in the oilsands region have taken issue with the Royal Society of Canada expert panel report, saying it drew conclusions about regional cancer rates using government and industry data — without talking to the people of Fort Chipewyan or taking into account traditional knowledge. The exhaustive expert panel report, released in its entirety Wednesday, concluded “there is currently no credible evidence” that pollution is reaching Fort Chipewyan at levels that would lead to elevated cancer rates. But many community members believe land, water and human health have been affected as a result of rapid oilsands development upstream. “We have the knowledge based on us living on the land and seeing what is happening to our people,” said Alice Martin, a Mikisew Cree elder who now lives in Anzac. University of Alberta environmental toxicology professor Steve Hrudey, who led the expert panel of prominent scientists, said his group examined all the current scientific data available, and also asked for information from First Nations and Metis communities in the area. No one responded. The expert panel’s sweeping report, written over a year, was meant to examine every aspect of the oilsands from an unbiased, scientific viewpoint. The report had a number of major findings and suggestions, including that no tailings pond has been completely cleaned up and government and industry need to do more work to halt an increasing inventory of the toxic lakes. Another of the report’s key points was the government needs to make sure enough money is set aside so Alberta taxpayers aren’t someday on the hook for cleaning up old oilsands sites. David Collyer, president of the Canadian Association of Petroleum Producers, said he welcomes the report’s objectivity, and that it shoots down some overblown criticism of the oilsands. “In fairness, it also highlights some areas that industry and government need to work on improving,” Collyer said. In a press conference reacting to the report on Wednesday, Alberta Environment Minister Rob Renner said the expert panel has raised a number of important issues, some of which his department is already working on. For instance, he said Alberta Environment is close to announcing a new plan to ensure land reclamation liabilities are covered. This entry was posted in First Nations, Tar Sands. Bookmark the permalink.